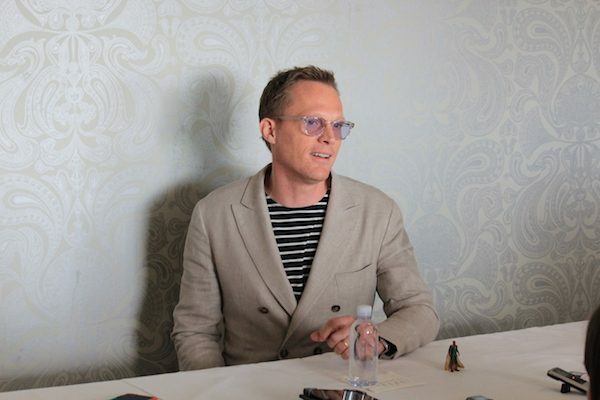 Possessing the iconic voice of J.A.R.V.I.S., Paul Bettany only had to utter a few words before the entire room of 25 female bloggers swooned and melted into a giddy, grinning audience. 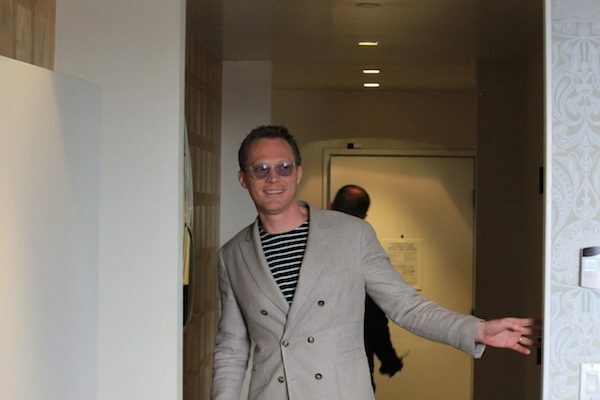 He came in singing casually and when we all erupted into applause and cries of joy, he spun around and left the room, only to enter again to experience the warm welcome anew. After a few more girlish giggles, we were finally able to form our first question. Q: We were just speaking with the directors (post on that coming soon) and they mentioned how hot it was filming the airport scene. Can you tell us about that experience? Q: How do you personally relate to Vision? Q: After being a director yourself, is it different being on the other end? 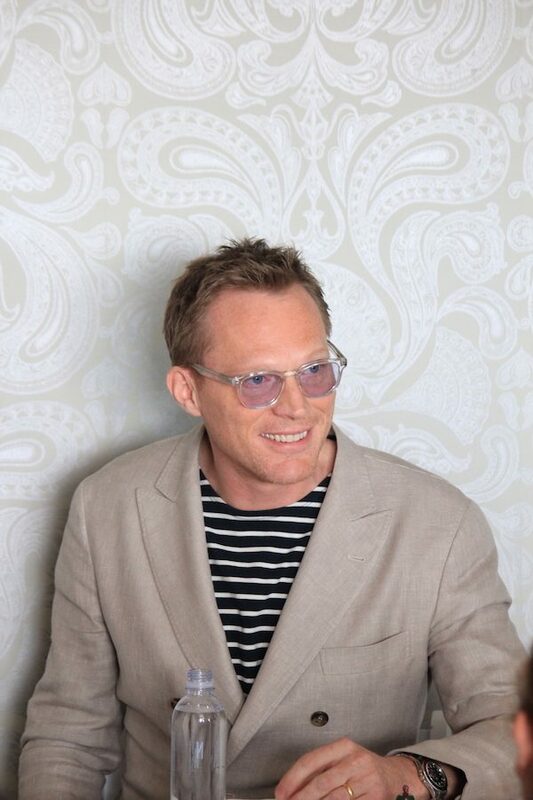 Paul Bettany: “Yeah, and I think more actors should do it. It really gives you a total… much more of a respect for the directors that you work with. And I really enjoyed my own period of being an actor and just enjoying my responsibility… because you’re obviously taking care of a much larger picture as the director. And your day is just filled with a thousand questions. Ninety-nine percent of which are ‘WHAT COLOR DO YOU WANT THE RED SHOES TO BE? !’ …What??? … Then, one percent of them being absolutely unanswerable questions that are gonna make you old. YES! Oh man, I cannot wait for him to do a funny movie. He’s already got such a great sense of humor and delivery. I can only imagine the ab workout a comedy by him will invoke! Q: Do you miss being the voice in Tony Stark’s (Iron Man‘s) head? Q: How do your kids feel about having a superhero in the house? Q: Going off that, how much of it was costume and makeup? And how much was CGI? Q: So, they weren’t contacts? Q: How many hours did it take for full costume and makeup? Q: What was it like being just a voice for all those movies and then becoming a character? Just when we asked about how many people have requested that he record their outgoing messages–because c’mon, how cool would it be to have the real J.A.R.V.I.S. be on your voicemail? 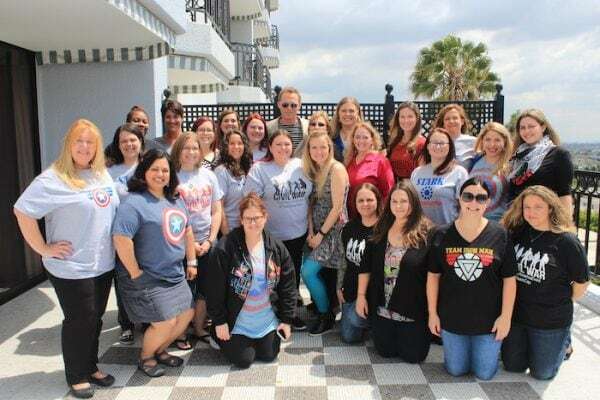 !–Chris Evans crashed our interview. It was completely spectacular. This interview was beyond unforgettable and I cannot thank Paul enough for being uncannily REAL. He set the stage for an amazing interview with Chris Evans as well. It’s easy to see why he’s considered the funniest guy on set. Elizabeth Olsen and Jeremy Renner also commented about on the hilarity he brings to set. Follow Paul on Twitter to keep up with his great work. 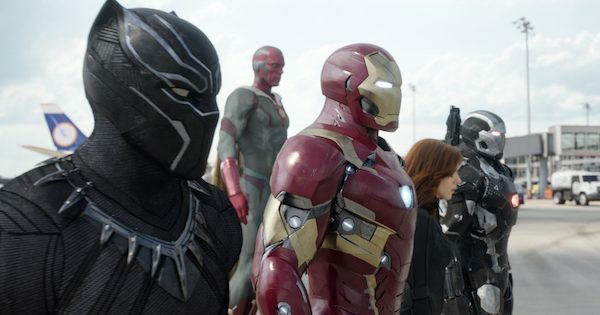 Captain America: Civil War – in theaters everywhere May 6th!!! 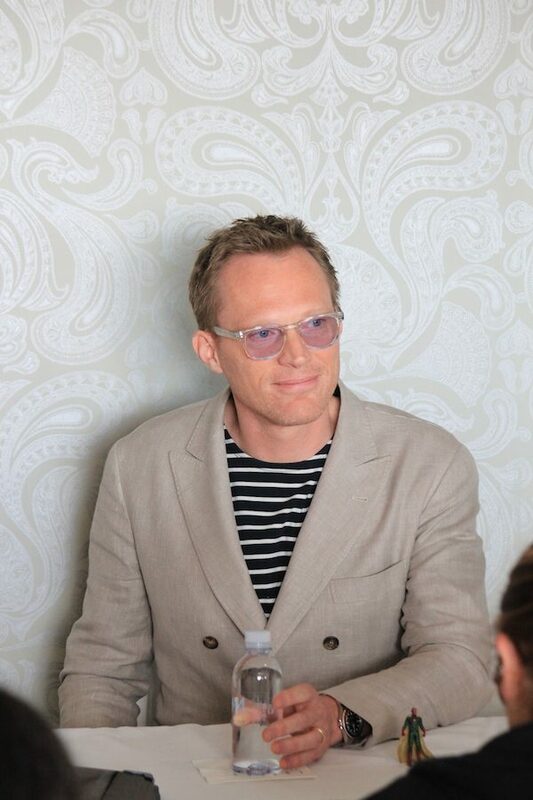 On a scale of 1 to 10 (10 being the best) how much do you love Paul Bettany as Vision? I say 100000000000000! Ah, swoon…. That was an incredible interview. Glad you got to do it.